DH has been working on a solution to our “cat box” problem. He’s been at it most of the day. Biggs braves the heat to lend support from the sidelines. The “cat box” is gone. Biggs goes to the door and asks to be let out. And sits in front of the door and waits for someone to come along to let her in. But, if Biggs used the dog door, she could go in and out without our help. DH thinks that’s what Biggs should be doing. Only using the dog door means going into our fenced-in backyard. Which is dog territory. Our other cats DO use the dog door. Then they race up the fence posts to escape from Buster chasing at their heels. Most of the time. Sometimes, when Simba, the orange tom, isn’t in the mood to be chased Simba just lies down. Buster gives him a disappointed sniff. And that’s the end of it. DH is right. Buster IS just playing. And, DH HAS been trying to train Buster. Only DH’s “Buster…no”, in my opinion, is said in too nice of a voice. I think our pack needs meaner more assertive leadership. Because Buster only stops sometimes. Other times, he pretends not to hear. To make up for DH’s over-niceness, my no is extra stern and usually followed by a psstt hiss, dog whisperer style. I point my finger, like Cesar, for emphasis. Only, as I am in cat protection mode, I end up doing assertive without the calm part. Which sends Buster slinking up against DH’s legs like he’s been whipped. The looks Buster gives me are reproachful and accusing. Biggs stays as far from the situation and dog door as she can. 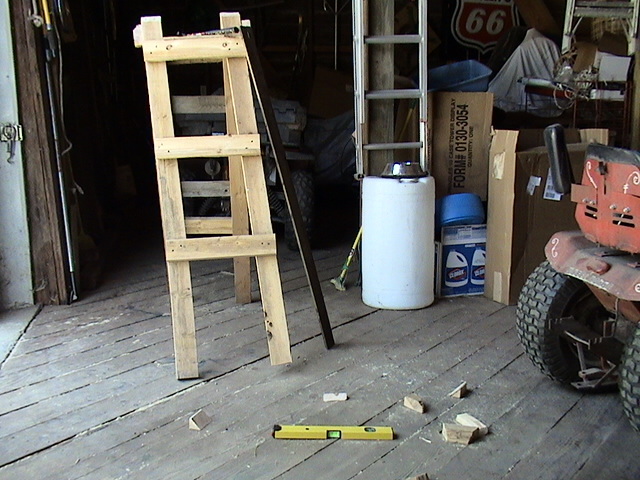 Today DH worked on resolving things and built a “cat ladder” for the cats. Now they won’t have to climb the fence and can instead zip up the ladder before Buster has a chance to get outside. 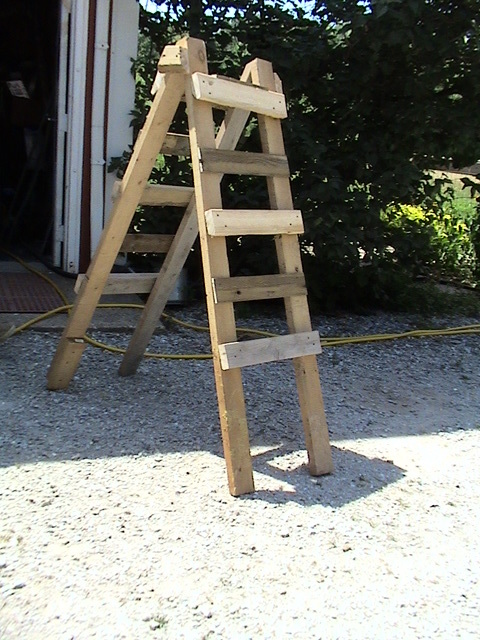 Using a ladder won’t be new. Our cats are up and down the ladder to the hayloft all the time. 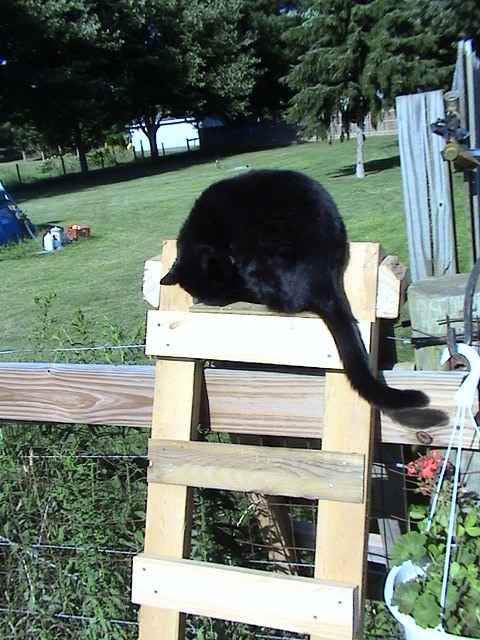 Kitty inspects the “cat ladder”. UPDATE: The cats were suspicious of the “cat ladder” at first. Only kitty would sit on it long enough to have his picture taken. BUT, today, only one day afterwards, every cat has successfully gone up and over, come in, been fed and gone back out to the barn. Without being chased. DH’s “cat ladder” is a success. Biggs contendedly gives herself a bath after using the dog door to go outside. Absolutely brilliant! We have two dogs and three cats, and one of the cats is afraid of the dogs, who seem to know this and chase (only) her. Our otherwise gentle, homeopathically-oriented vet has even suggested the use of shock collars to teach them not to chase her. I commend you for working out a solution that saves the cat’s nerves!! I passed on your compliment to DH and he was so proud! The news today is even better. All of the cats have mastered and are using the ladder. If you do try a shock collar let me know how it works. I would like to eliminate cat chasing altogether. Plus Buster sometimes runs away on walks in the woods despite being called. I am impressed w/ your husband! my cats refuse to go outside. My big fluffy cat never has ventured out in his 4 years….our rescue has, she was abandoned by dopers when they were evicted in the dead of winter. She doesnt like the outdoors now. Cant say I blame her. I am still envious of you being litterbox free! 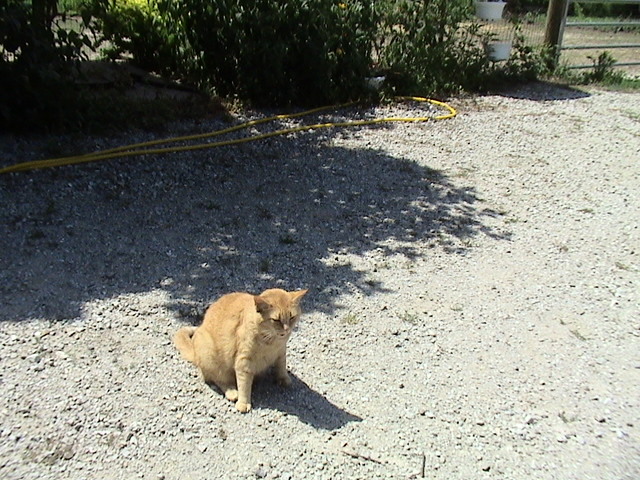 Our cats love the outside which includes the barn and hayloft. In the winter they only venture out to do their business and spend most days curled up on beds. But as soon as it starts to get warm, they are out after breakfast and not seen again until dinnertime. What a smart dog you have. The cat ladder is great. Maybe I’ll have to try something like that (though I might have to build it myself). I don’t have chasing but do have to feed my cat on top of the piano to keep the hungry shih tzu away from her food. The cats are lots happier now. My husband is thrilled by all of the compliments. Laughing at the mental picture I am having of Over50’s poor cat having to eat on top of the piano.